Amla is also known as the Indian gooseberry, amlakka or amlakai. In Hindi, it means the “sustainers”. Gooseberry is very rich in Vitamin C, and contains many minerals and vitamins like Calcium, Phosphorus, Iron, Carotene and Vitamin B Complex. Amla is also a powerful antioxidant agent. Amla is a highly potent form of Vitamin-C. 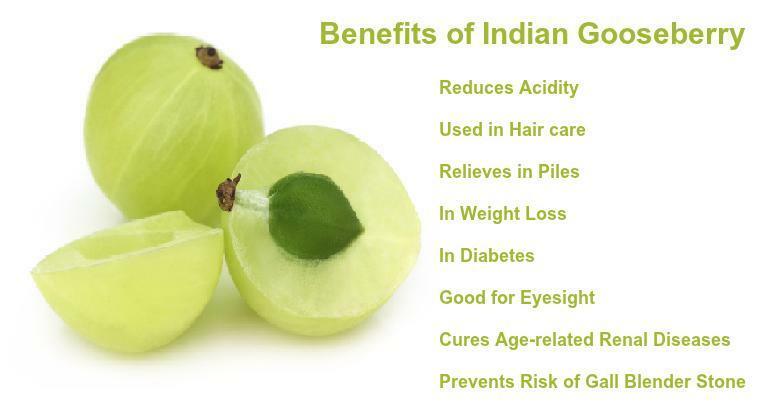 Here on these page we will see some of the important health benefits of Indian Gooseberry or Health Benefits of Amla. Amla reduces acidity. It’s a lot more slow and gentle than other herbs that aid digestion. It helps by preventing the risk of gall bladder stone. Amla works as a hair tonic and is an essential ingredient for hair care. Amla oil is very popular in India because it has been shown to reduce the chances of hair loss and baldness. Amla juice is helpful in relieving constipation in piles. Amla is a fibre rich fruit. It helps in the healthy bowel movement and makes gastrointestinal tracts clean. Blood sugar level can be maintained by the consumption of amla. Drinking Amla juice with honey is good for improving eyesight.